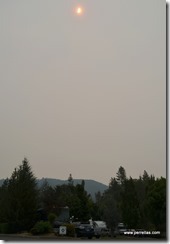 Up and off early morning from Myrtle Creek, tail winds blowing the wildfire smoke around every mile we travel. 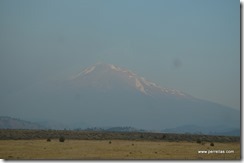 Our journey was through haze of varying degrees letting us know it would be a long time before we saw clear sky’s. 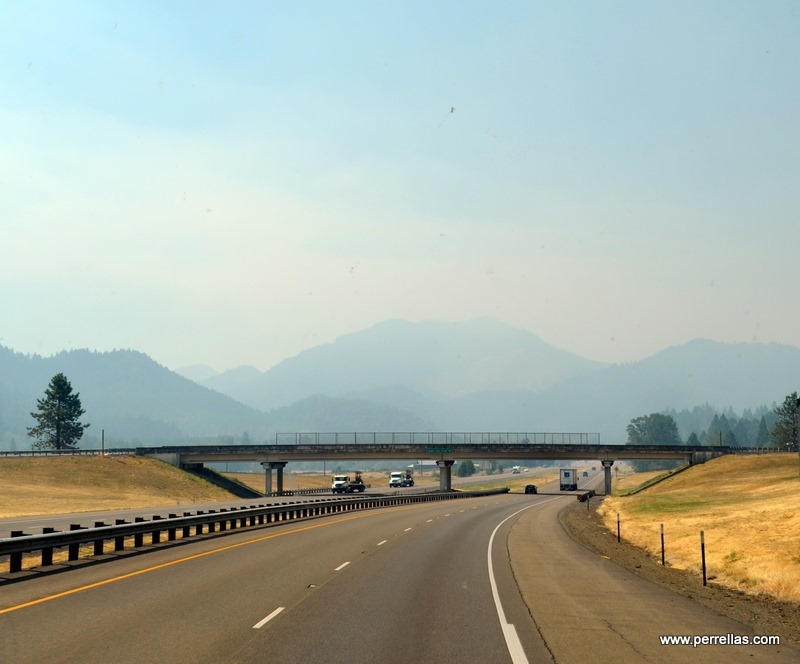 Nearing Grants Pass, the smoke hung over the mountains. Dropping down into the valley, we arrived at Jack’s Landing in Grants Pass. 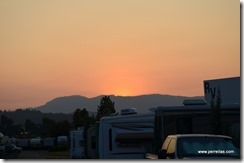 While setting up camp, we could still see the hills across town. The park borders Hwy 5, is clean, well-groomed with level cement pads but somewhat noisy from the traffic when you step outside. Inside the RV was muffled enough to be acceptable for a good night sleep. Our site had a landscaped park like setting in the middle section with a small pavilion and picnic table surrounded by grass. 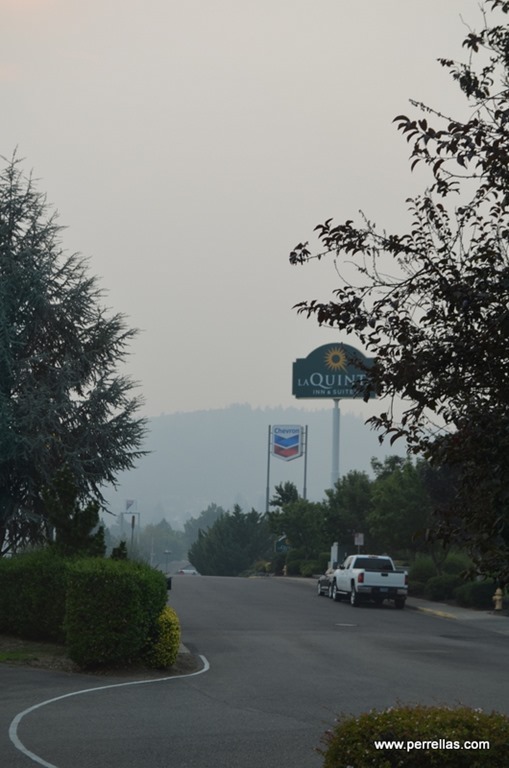 Within an hour, our view in the distance became hazy grey and the air had a strong campfire smell lingering outside, as well as inside every grocery store and local building. Back to LilyPad to batten down the hatches. 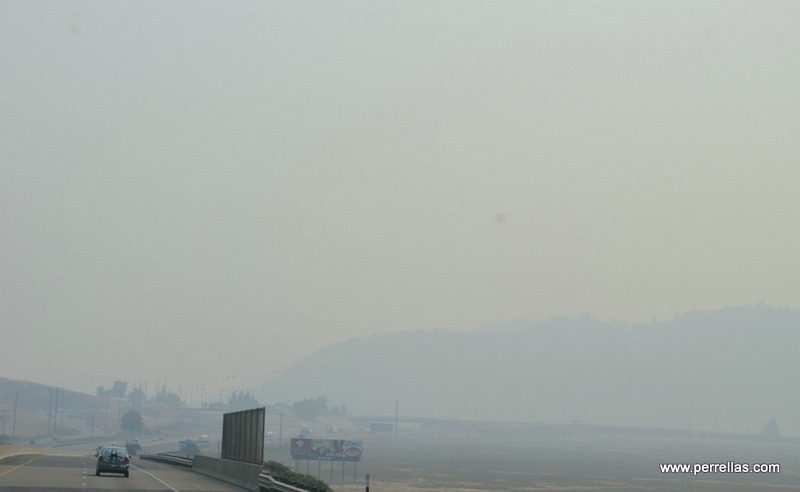 A gusty morning wind had temporarily cleared the heavy smoke from the valley but it returned, the fires still raging out of control along the coast. By 6:00 pm, the grey crept over the entire city. Comfortably settled inside, I opened the freezer for ice cream. Water dripped out. Everything else considered, not a comforting sight. We added one more repair to our list. Checking the internet for the area, no authorized repair center for Maytag was within 100 miles of our current location. Bad ball joints cancelled traveling to an authorized repair. 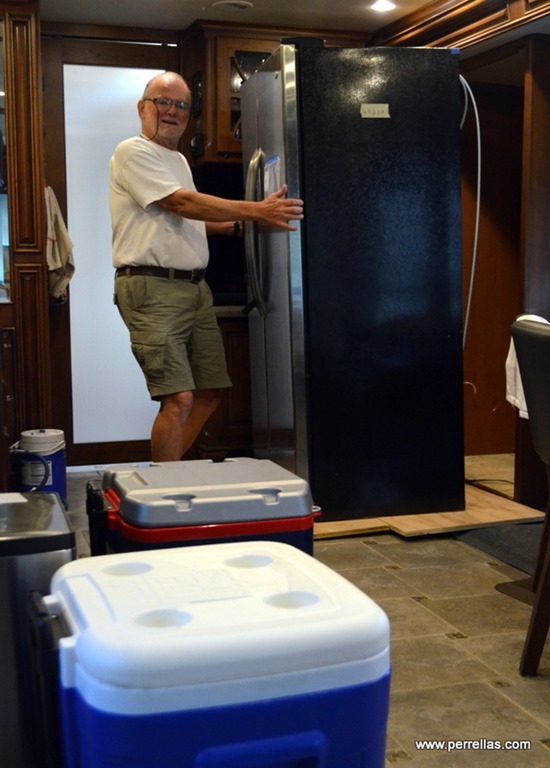 John bought another ice chest, a few blocks of dry ice and we moved frozen foods to the basement freezer and what didn’t fit into ice chests. Silver lining…the freezer was going to get a super thorough cleaning. Heavy smoke rolled back into the valley sometime during the night. We kept busy inside, searching for an RV refrigerator repair man, deciding the location of our next overnight and eating every drop of the soon-to-be-melted Halo Mint Chip ice cream. Several referrals later, we found someone who “might know how to fix your refrigerator problem”. We were on the schedule and hopeful a solution would be available quickly. The waiting continued. Time passes slowly when your nights and days are spent indoors. To date, I had been stuck inside our 350 square foot motorhome for several weeks and spent nearly a week living out of ice chests. Being blanketed by choking hazardous level smoke while waiting for repairs was contributing to an already tense situation. Knowing my 89 year old dad and step mom were along the coast where the raging Chetco Bar fire surrounded their home, burning out of control for over 30 days with zero containment added further anxiety. This morning, local news was describing Hurricane Harvey gathering strength and bullying its way towards Texas. Landfall near Houston would threaten the safety of our immediate family and friends. When Harvey hit, our daughter in Conroe was completely surrounded by flood waters and stranded in her apartment for nearly a week, safe but soggy. Our son and future daughter-in-law had water surrounding their home and streets. When the waters receded, they spent their days helping neighbors and friends nearby, opening their home to friends who had flooded. Texans, along with thousands of Americans all over the US, were suffering a multitude of Mother Nature’s wraths. My distress level had reached dizzying proportions and our days switched from concentrating on repairs to contacting family and friends. Although there was heavy damage surrounding everyone we knew, no one flooded out completely and all humans and creatures were safe. something for which to be eternally grateful. This morning, the dreadful prospect of another day indoors was joyfully interrupted by a temporary but strong wind, first time in over a week, blowing smoke out of the valley. The clearing produced visitors. Down from Redding with their two adorable mini’s came family. We ate breakfast out together and I had the enjoyable opportunity to bounce their youngest on my knee while his mom ate. 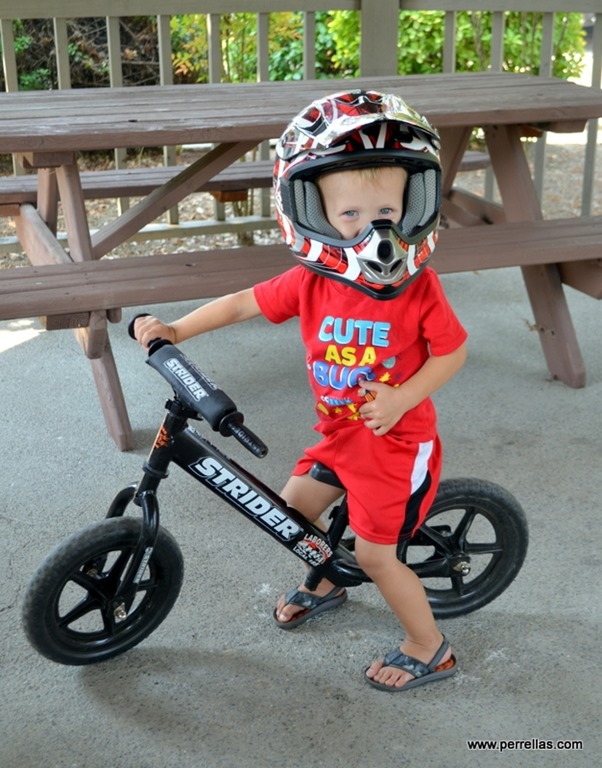 Back at the RV, we watched our fearless grand-nephew fly around on his peddle-free balance bike in our park, his oversized dirt bike helmet weighing as much as he. 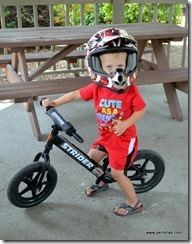 Still a toddler he is extraordinarily athletic and fearless, entirely his father’s son in abilities. Our visit flew by but the time spent with family warmed my heart and relaxed me down to my core. 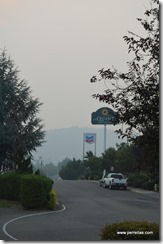 By late morning, the smoke rolled down into the valley and I was forced back inside. Next morning we rose early for refrigerator repair day. John pulled the unit out of the motorhome wall. A few bangs with a rubber mallet at precise points, probes into refrigerator guts and a great deal of testing resulted in additional unhappy news. The compressor is dead. Only one guy, not this guy, can do the repair…possibly. Another appointment scheduled and more waiting days. No one can replace the whole unit. The only way it can be taken out is through the window and equipment for this type of removal, in this part of California, is nowhere to be found. A few days later we were visited by a new repair man. Slightly over a grand drained from our pocketbooks, one problem checked off our extensive repair list. Installation of a new compressor and relay switch had fixed the freezer. Frozen foods back in the immaculately clean freezer, the waiting game continued. When we left family in Brookings, the plan was to meet up with cousins along the coast in Waldport Oregon to view the Total Solar Eclipse. 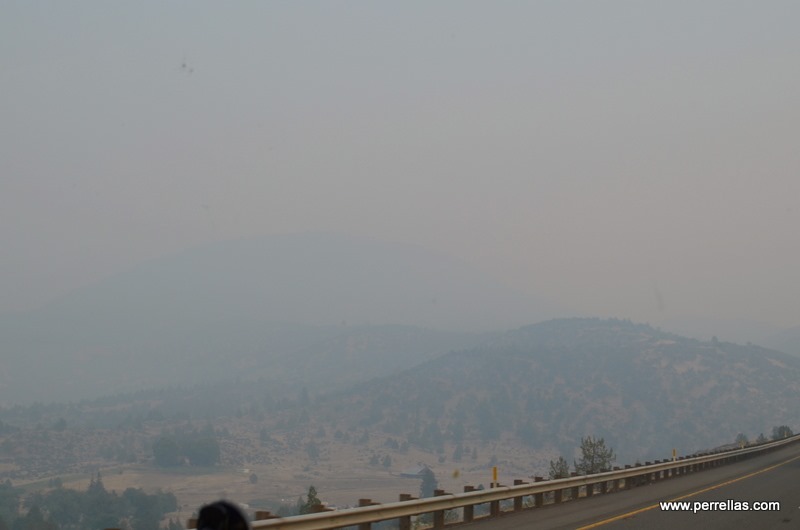 Smoke, fires and road closures made the gathering impossible. 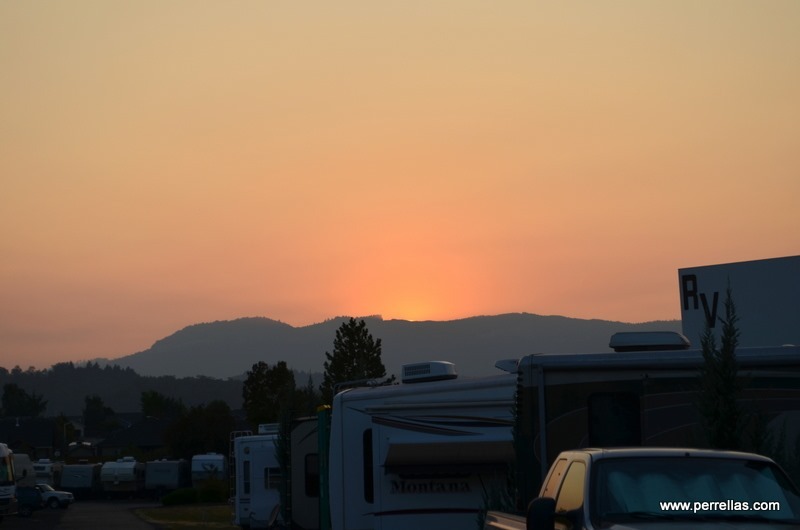 This once-in-a-lifetime event was viewed from our Grants Pass RV park site and substantially obscured by wildfire smoke. John ventured outside to take a picture while I looked out our window. 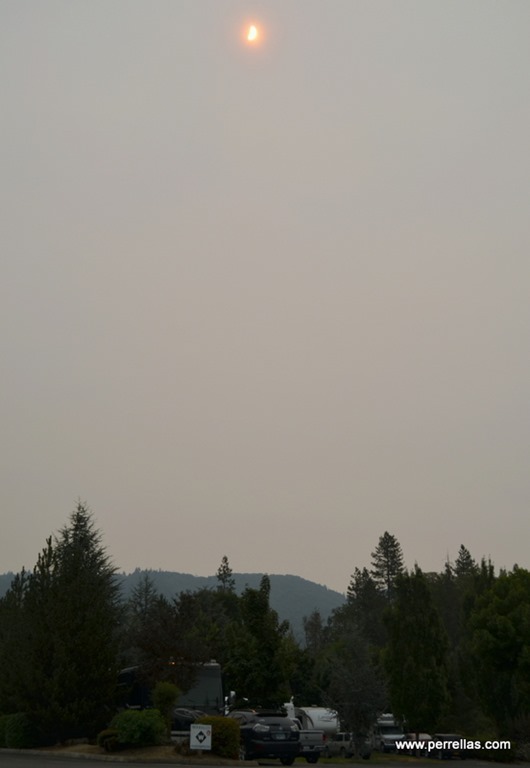 A bit of a let down but under the circumstances, a better view than what we would have experienced engulfed in smoke sitting near uncontained blazing fires continuing along the coast. As my cousin repeatedly reminds me, “it is what it is”. TV, bed and another day of waiting passes. Finally, LilyPad’s repair day arrived. 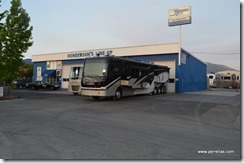 We checked out, drove to Henderson’s and moved into our designated “up next” location for the night. In the morning they will install new ball joints and boots, a new suspension system and new shocks. Reading rave reviews from all over the country eased our trepidation of having major repairs done outside Red Bay Alabama or Conroe Texas. 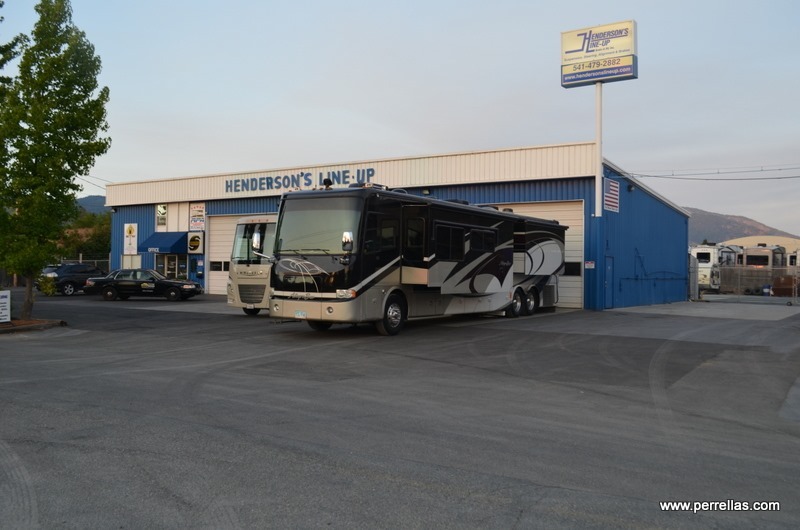 We are confident and comfortable with Henderson’s expertise. Patiently waiting for our luck to change, enough to move us on down the road and make smoke disappear from our lives, spoiler alert…not going to happen yet. 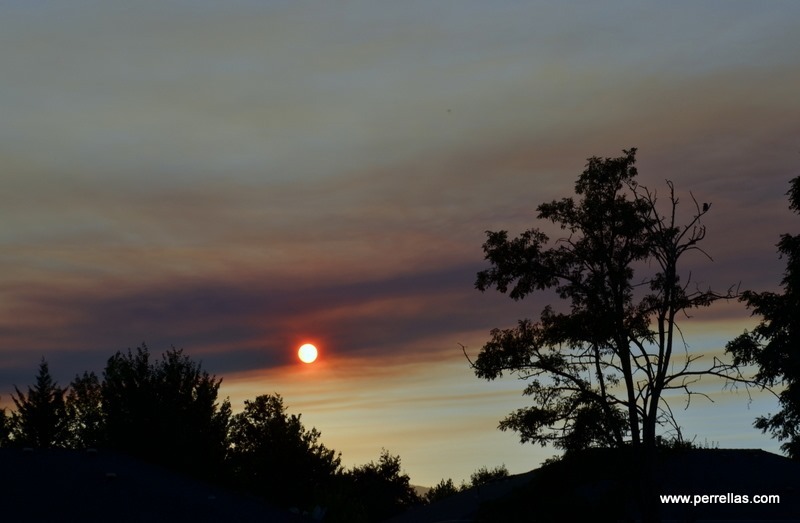 Gusts of wind blew the air clean in the morning hours but as day dimmed to dusk, the smoke floated back into town and intruded across what would have been an incredible sunset. Another early rise to let Henderson’s “do their thing” while we spent the day inside stores fleeing the smoky out-of-doors. Professional, timely but costly, price shopping to cut costs or ignoring mandatory repairs leads to disastrous results so we considered the money paid was well spent. All suspension work complete, we paused overnight in the parking lot of Henderson’s searching for a smoke free area to wait for the fire in Brookings to come under control and allow us to have our a/c installed. 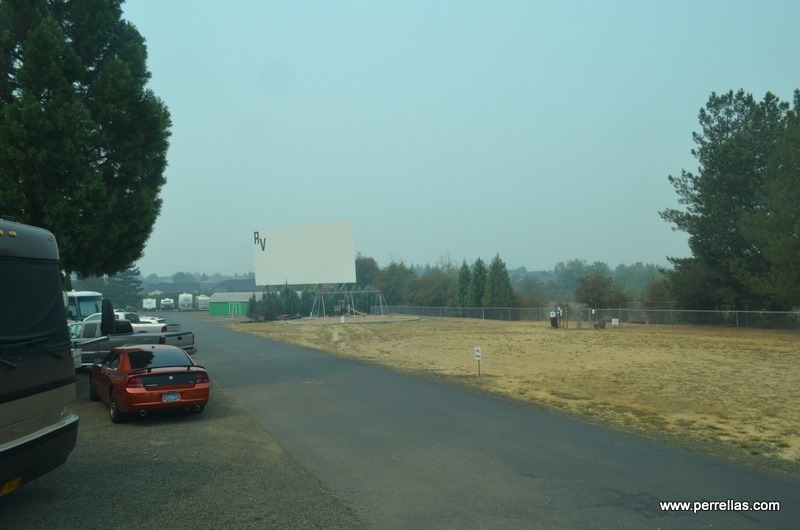 We took a chance Roseburg would stay free of smoke and made reservations for a week at Hi-Way RV Park and Movie Drive In. John and I had stayed several times in the past but not on a weekend when movies were shown. 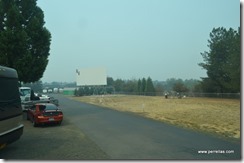 Hours later, leaving smoke behind, we pulled into the RV Park. 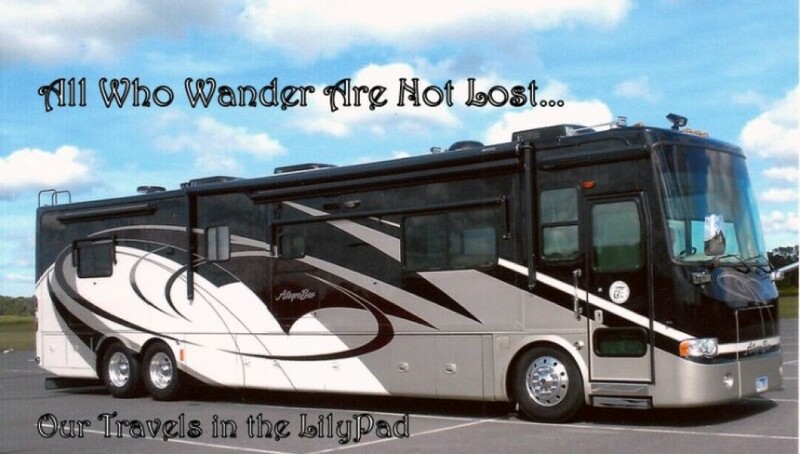 Through each road bounce and roll, John remarked how well the motor home was handling on the drive. Two thumbs up for Henderson’s. The managers of this park arrived here several years ago after leaving the RV park on 242 in Conroe, Texas. 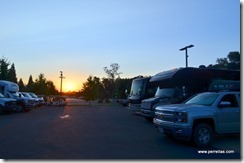 We had stayed at the RV park in Conroe and chatted together several times. For a bit, we discussed how each of our lives had changed. They returned to work, I walked outside and stood, letting the sun shine down on my face while John unhooked the car. 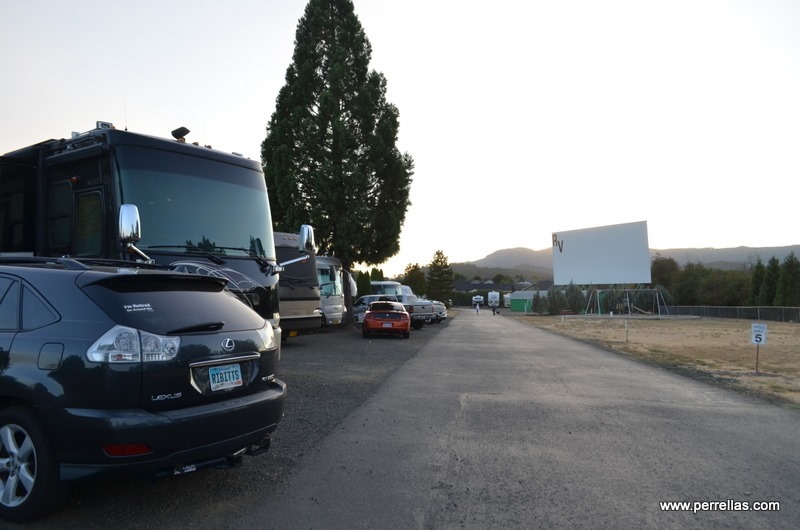 Our space was first row, we would have an up close and personal space for the movies. First night featured Laurence of Arabia, the second night The King and I. 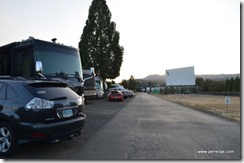 We had popcorn, comfy seats and air conditioning. Our large driver side window gave a clear view of the movie. Finally excited about the prospect of having a little fun, we rolled forward to our site. Pulling in, LilyPad was halted by a big low branch which hooked itself under our roof air horn. We called the front desk and maintenance came, pulled the limb out from under the horn and cut down branches so we could move forward. John released the brake and LilyPad set the brake. John released the break again and gunned the engine and LilyPad stubbornly set the brake again. After three attempts, John realized the air compressor, designed to lift LilyPad up and control the braking system, was not filling the air bags enough to move forward. Hmmm…not good! We inched our way into the space and put the stabilizer legs down. John made calls to a truck repair and we watched our blue skies turn hazy, then grey, turning to ugly smoky brown by days end. In the evening, the movie’s clarity was distorted, the sound was low and garbled and my mood sunk lower than a snake’s belly. It’s becoming apparent, it is not possible to escape from these horrific and smoky fires. The effect they are having on this side of the country is beyond scary. 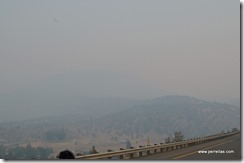 When I checked the Oregon Smoke Blog, our area had sucked the air from the gargantuan zero contained Chetco Bar Fire now burning through 100,000 plus acres. The nightmarish waiting game continued. My lungs were severely unhappy, my airways struggling, regressing from the ability to breathe using an inhaler, to forcing me onto my travel ventilator with much stronger and multiple liquid meds. Venturing outside would have chocked the breath from me so I concentrated on enjoying my computer and keeping up with family and friends on Facebook. Dinner, bed and sleep. Next morning my computer became uncooperative, refusing to connect to our internet. John spent several days using all his computer repair knowledge trying to solve the problem before giving up. 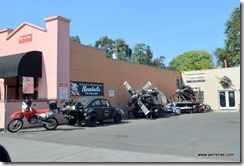 He made a solo trip to a repair Geek in Roseburg, someone we had used two years prior. After keeping the computer for a few days, nothing was determined and John brought back my ailing Dell. The fix would have to wait for our next multiday landing. Dreary, depressing same old, same old continued. The mobile diesel repair man came this afternoon, checked the undercarriage near the air bag valves, told us he couldn’t find anything wrong and charged us an outrageous amount of money for his time. Good news, bad news, no news, it all costs money, halts our travels and steals away happiness and tranquility. This week, maximum ragweed pollen counts were added to hazardous smoke levels outdoors, a detrimental combination of conditions for asthmatic lungs. 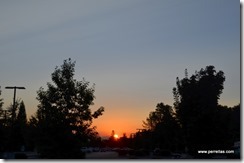 John and I discussed what were our chances for improved air and pondered how to stay upbeat. 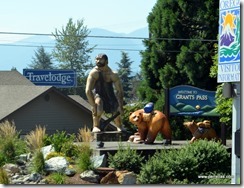 John suggested we pull up and out of the RV park early. 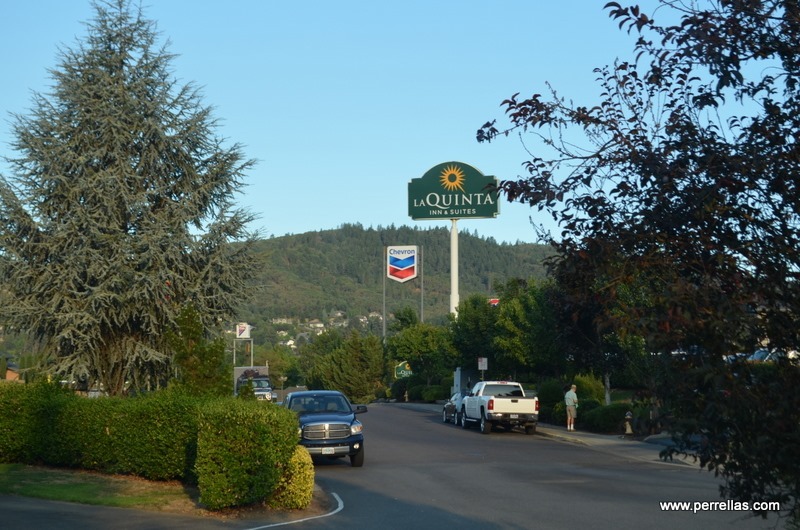 Extra days paid but not refunded, we pointed LilyPad towards Redding for an overnight, then on to Eureka in search of a waiting place with clean air. 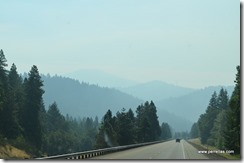 Highway travel was slow, air was thick, both HEPA filters were running full blast. 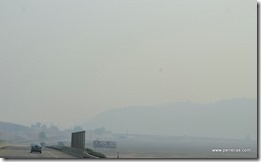 Hour after hour, smoke made the scenery barely recognizable. 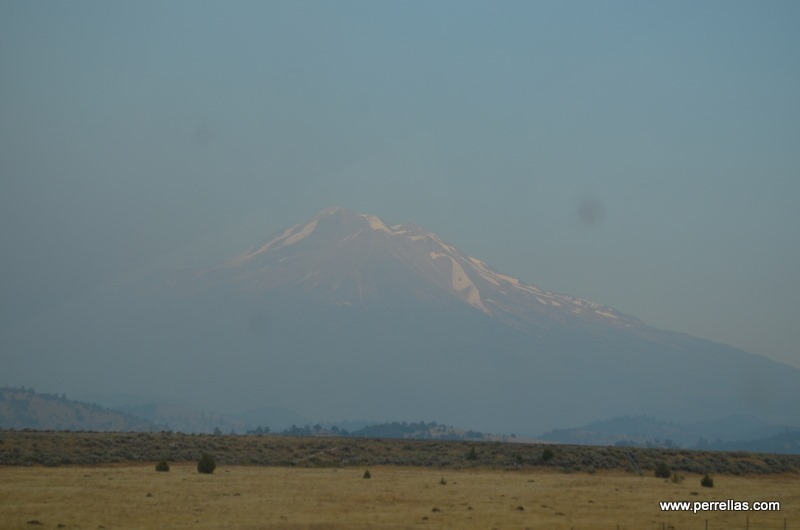 Passing Lassen National Park, the mammoth mountain veiled in smoke, its beauty dimmed by the haze. 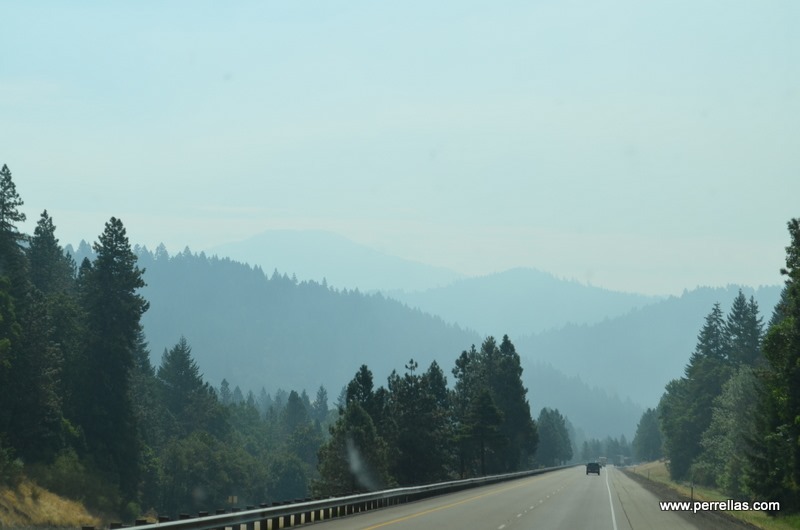 When we reached the other side, you could see the smoke bumping up against the mountain, the monster wildfire exhaust seeping around the edges in an attempt to move past. 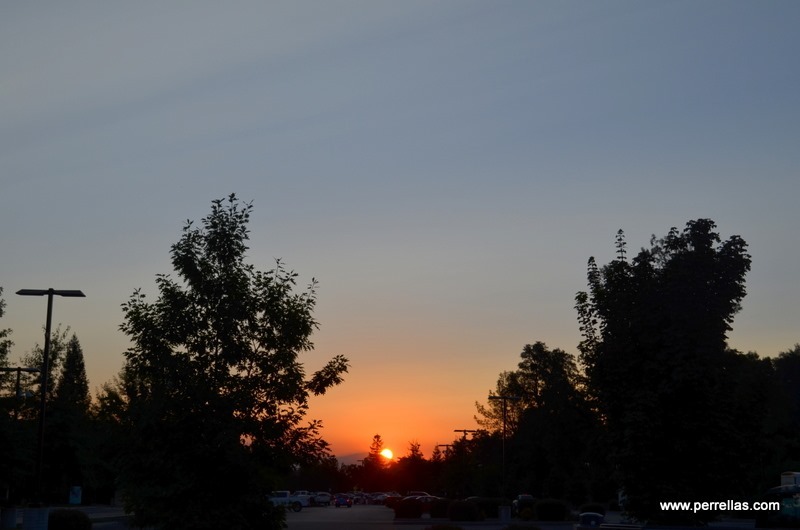 rising at sunrise for our travel to Eureka with prayers going up to please keep the air clear. Another spoiler alert…once again, it wasn’t in the cards. On to the ocean and Eureka. 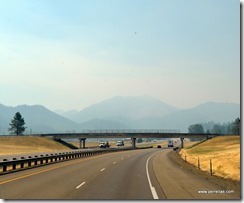 Our travel was slowed due to wildfires nearing the road in several sections of the highway. After we passed through, the road closed for several days before opening up but allowing only a few cars through either way, one at a time. 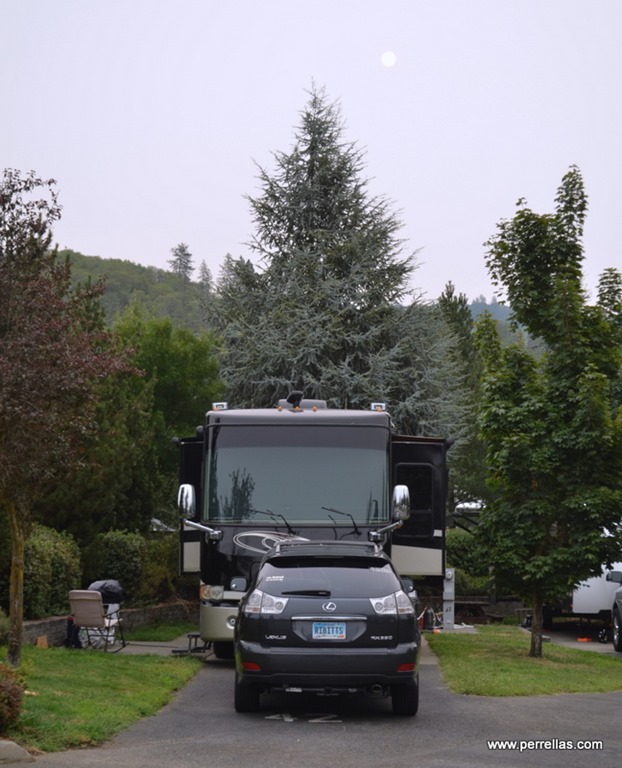 Temporarily on the other side of the haze, we arrived on the coast at one of our favorite Elk Lodge RV Parks, Eureka Elks Lodge in California. Setting up, it was clear enough for me to be outside, my lungs sucking in much appreciated misty salt sea air. Clear air didn’t stay for long, rolling in and covering the area mid evening. After a little research, we found Eureka had a suitable well rated RV repair shop to install the air conditioner and a Geek repair for my computer. John would retrieve the a/c from smoke inundated Brookings and have my computer fixed while I remained indoors in Eureka. 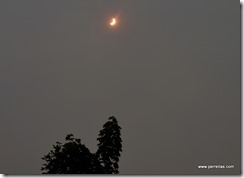 John made his trip down the coast in dense smoke. 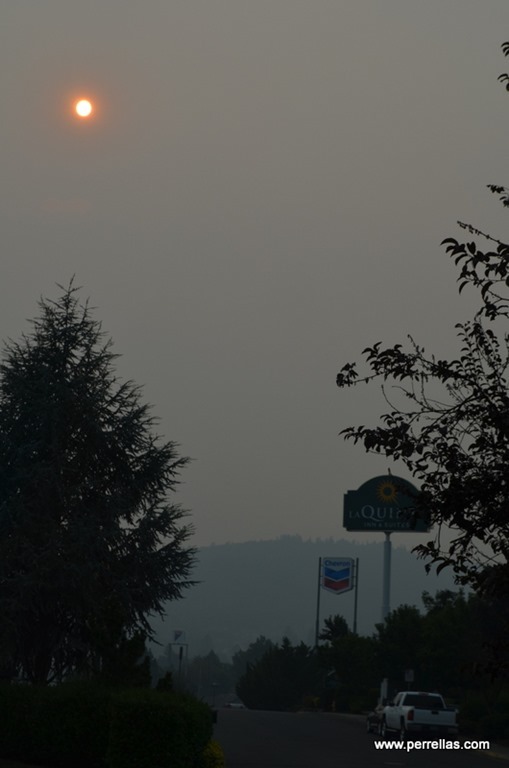 The air around Brookings was mind-boggling, so thick the fire camera monitors didn’t register anything recognizable, not even a hint of the surroundings. I was thankful my computer would, once again, be available to provide entertainment while I waited nervously for John to return. 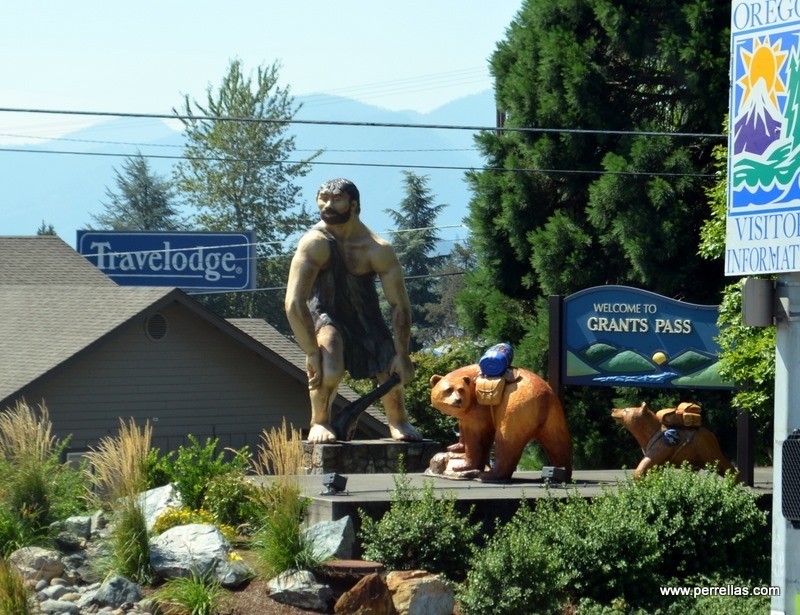 If you think this trip is the dullest account of a West Coast adventure ever, you should try living it while sealed indoors, saddled with daily potent asthma drugs and constant anxiety. Not having an iota of “fun” is a humongous understatement. Cabin Fever is an idiomatic term for a claustrophobic reaction taking place when a person is in an isolated or solitary location, or restricted to the indoors. 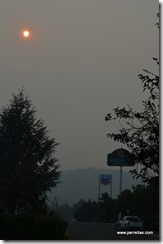 August 6th we arrived in Portland Oregon and were soon blanketed by smoke as the sun began to set. 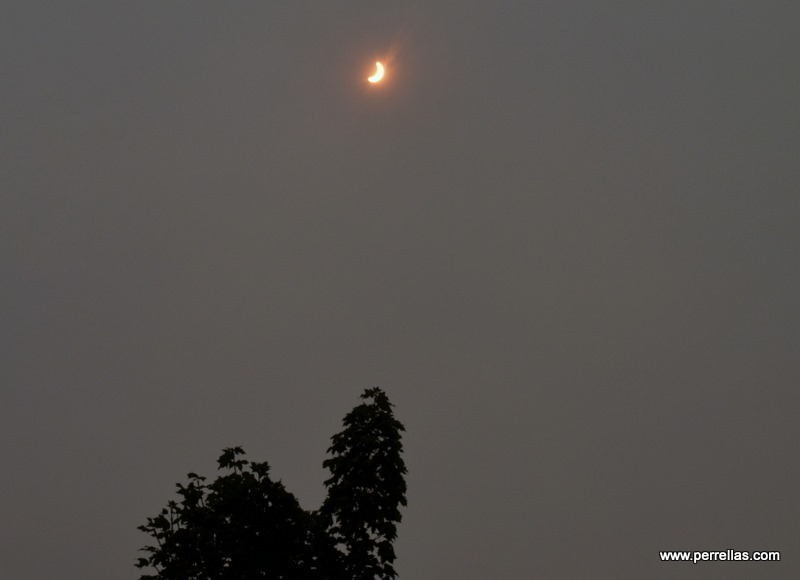 We have been engulfed in smoke, except for a few hours, ever since. Today is September 6th and I have remained indoors for 99 percent of the past 30 plus days. My time indoors has not yet ended. Wearing “Life Is Good” t-shirts to boost my spirits have miserably failed at their intended job. 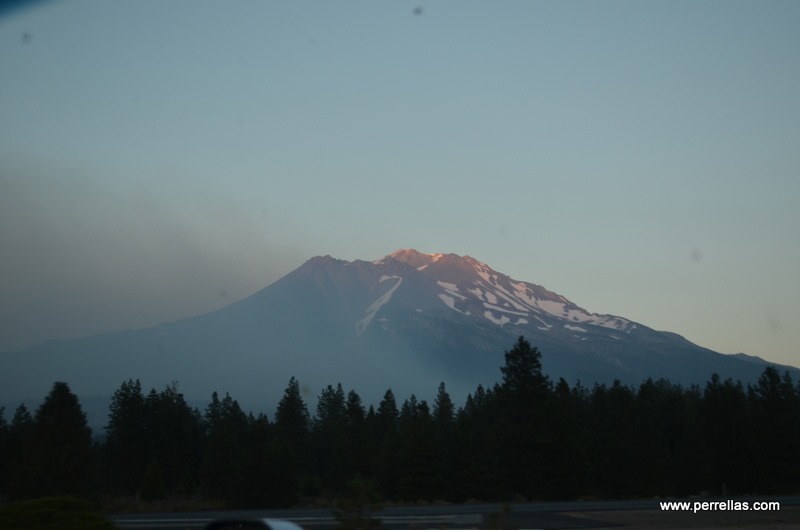 I wish we had taken the hint, driving into Chico and seeing dozens of rescue and emergency fire teams traveling towards the West Coast area back when we arrived in California for our West Coast Trip. Smudged with black and streaked with dripping pink fire retardant, the trucks were an obvious sign of wildfire. Stubborn like my dad, I ignored the signs and we continued forward. I wanted to enjoy one entire season without workamping, free from major drama or continual stalls in Podunk towns for repairs. And how’s it working out for me? So far, the experience has convinced me we should buy a house and stop insanely rolling around the country. 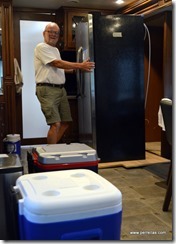 John returned with the a/c, we drove our home-on-wheels to have it installed. A few hours later it was chilling properly and we parked at the Elks for one more night to get an early start in the morning. 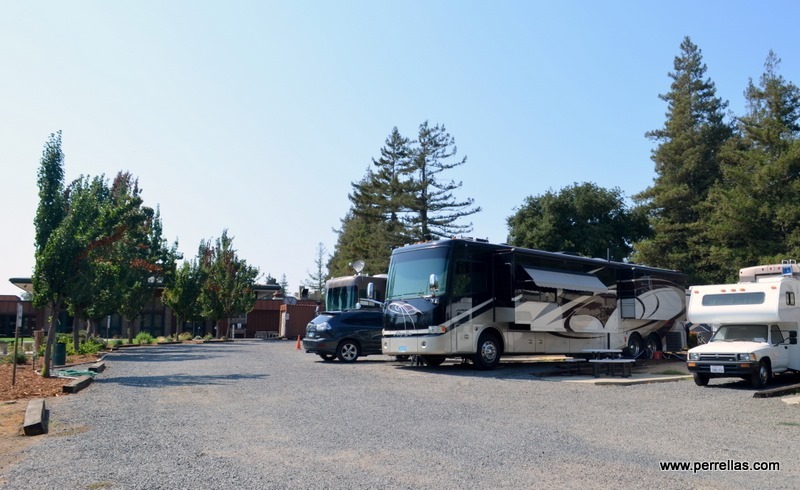 Today we travel to Napa and will stay at the Napa Elks RV Park. First time here, our overnights began far better than expected. 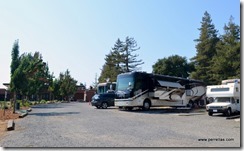 Upon arrival we found the RV park tucked comfortably into the back quarter acre of the Lodge with a pleasant setting. Back-in but spacious gravel sites, our front yard is the entire park like space in back of the Lodge. Currently in transition, the area looks spacious and when complete, inviting. A level tree shaded trail follows a stream and is a few yards from our door. I am overjoyed at the prospect of having a fun experience but approaching joy with trepidation. Many of our worst experiences have begun with positive expectations. The weather is not overly hot, no humidity, blue skies and friendly neighbors. I spent the evening in search of wineries with high ratings of deep robust reds before retiring. We slept soundly, fully relaxed for the first time in substantially over a month. 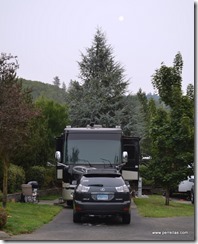 In no hurry, we rose late, enjoyed our coffee while browsing through TripAdvisor’s “things to do in Napa”. Not surprising, winery tours and tastings made up the majority of the listings. So many choices, so little time! 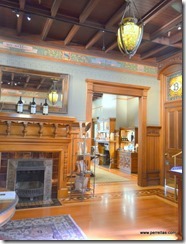 Making sure my favorite would be visited, Beringer was positively happening today. The rest would keep for tomorrow. We both guessed 11:00 am was late enough to begin imbibing in sips of the fermented grape. KatieBug had her extended walk along the stream and we left for St. Helena, a short jaunt from Napa and the Beringer Winery. 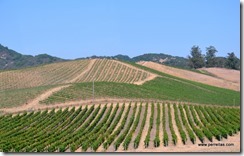 Naturally, wine vines and winery’s dominate our scenic drive. 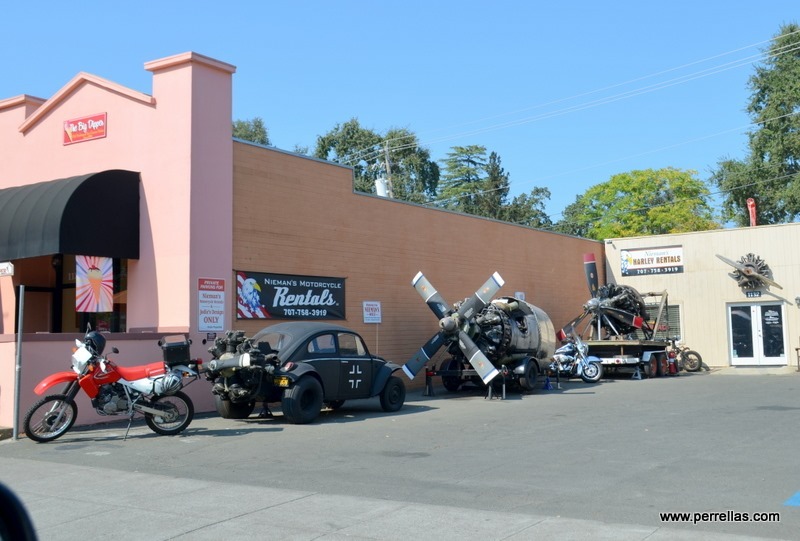 On our way, we stopped to check out the motorcycles at a motorcycle shop in St. Helena. 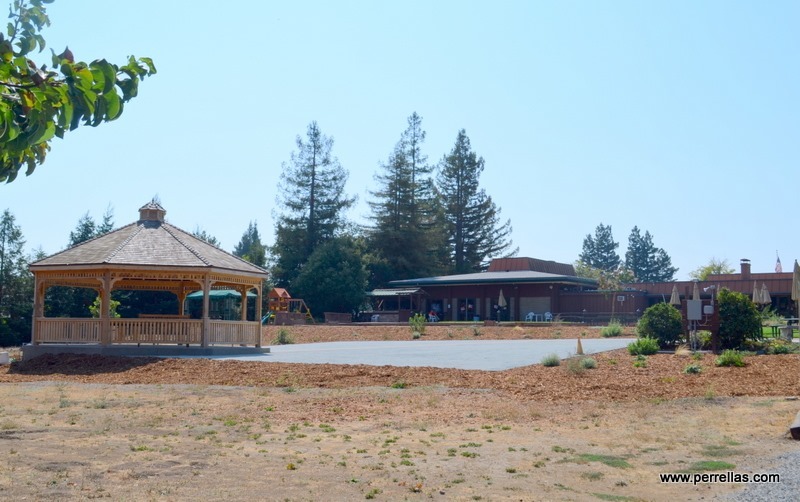 Entering the winery, you are welcomed by a gracefully shaped and manicured grounds and a woodsy scent emanating from giant Redwoods. 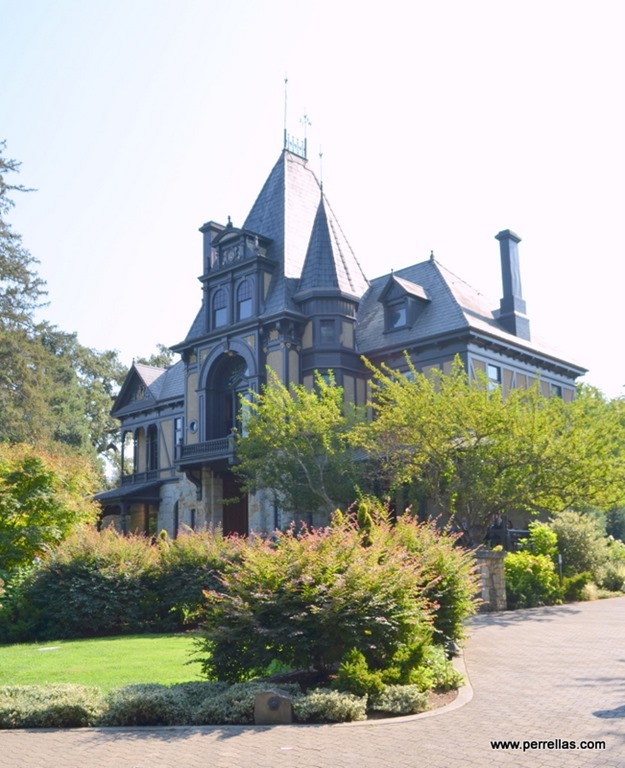 The crowning glory of the estate is the1884 fieldstone Rhine House, the Beringer tasting room. 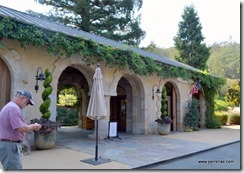 The visitor’s center at Beringer Winery was our first stop. More interested in the tastings, we passed up the tour and continued our walk to the Rhine House. 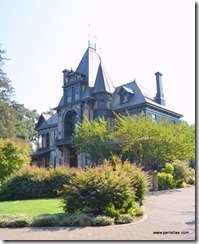 The winery was established in 1875, when German immigrants Jacob and Frederick began building the winery. 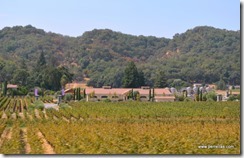 The Tunnel of Trees was planted and still graces the front entrance road to the winery. 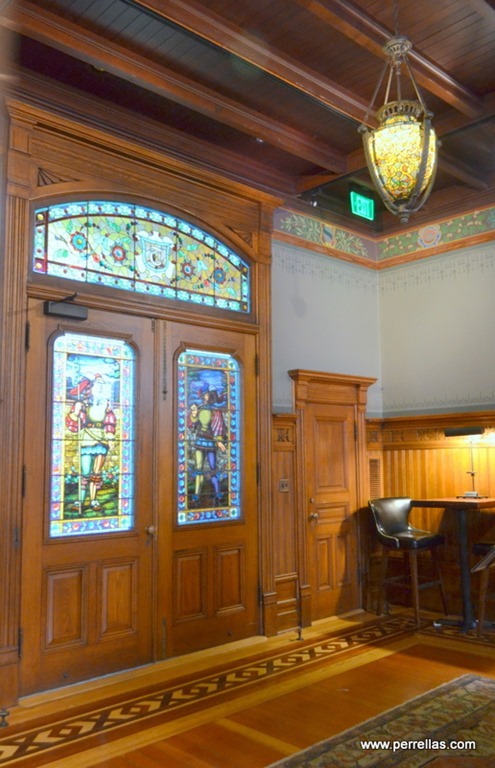 The Rhine House, now the tasting room, was their home. 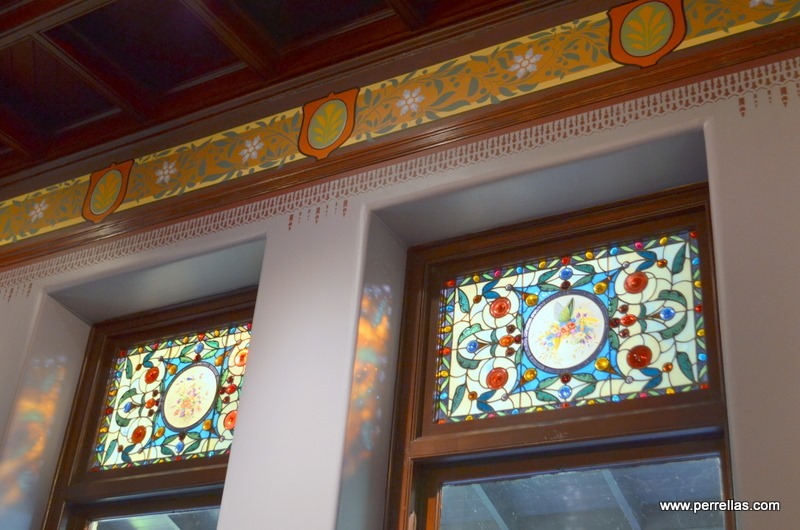 Elegant but comfortable, I slowly walked around the home in admiration of the intricately carved woodwork and exquisite stained glass windows. 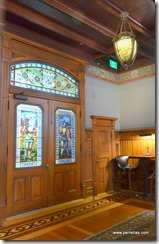 Inside the tasting area, the stained glass windows tinted the rays of sunlight and warmed the entire room. Jacob and Frederick built the stone winery building and hand dug the wine caves. 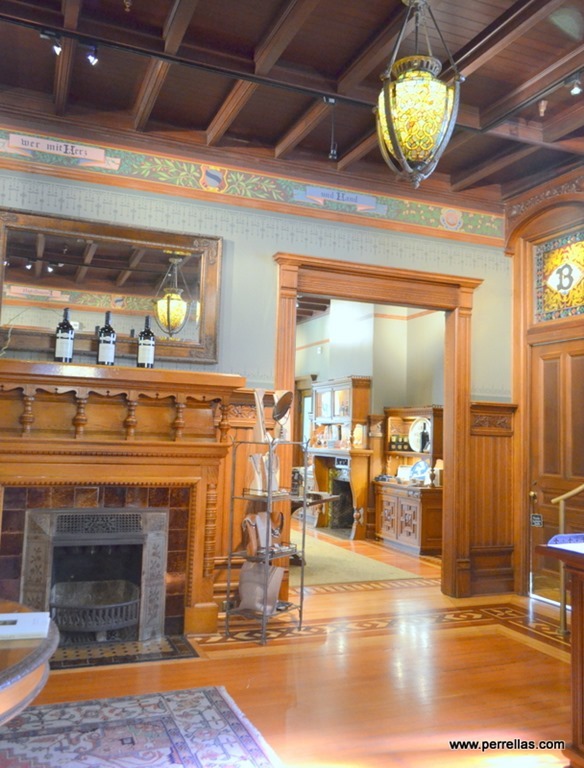 Beringer has been making wine for over 141 years. 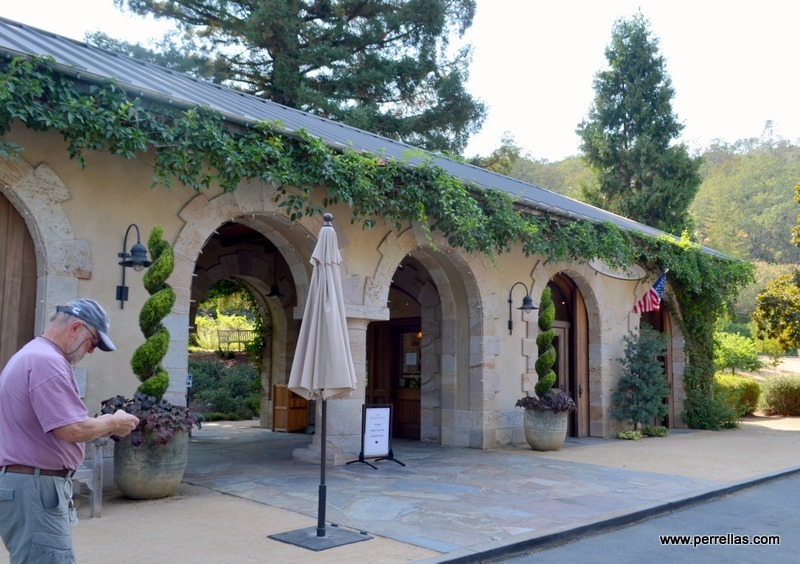 The grounds and buildings give you a sense of the attention to fine detail, elegance, style and artistry of yesteryear Napa. Mark Beringer, great-great-grandson of founder Jacob Beringer, joined the winery last year as its Chief Winemaker and so the Beringer wine empire continues its excellence in wine production. John paid for a tasting and our friendly host poured generous samples. Along with the tasting, we bought a wine club membership. Our purchase included freebies, a wine chiller bag, wine glass trivet and two bottles of red wine. We toasted another year of rolling through good and bad times and left in a greatly relaxed state. Back to LilyPad, early to bed, Red Box movie and sleep. Today is my birthday. I’m old, enough said, subject closed. 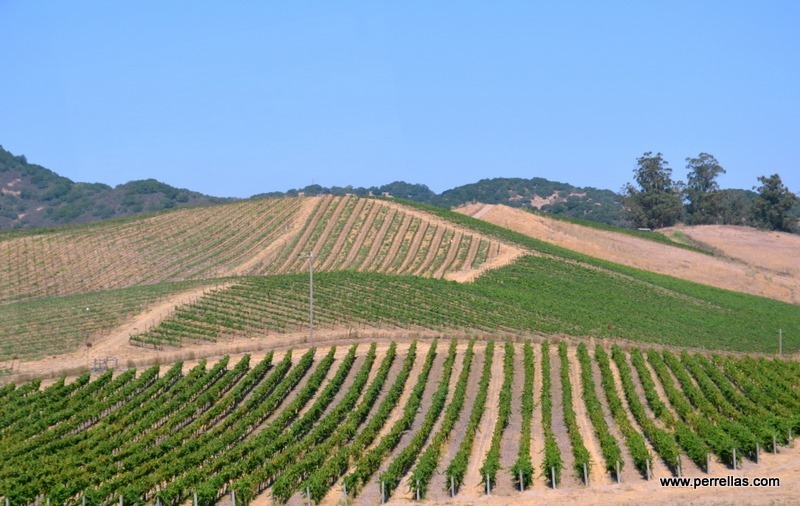 Our day starts with the list of wineries offering the best red wines in Napa, according to the phrasing given by each winery. The sales pitch on the first of our choices, Artesa Vineyards & Winery, claimed to have the setting, grounds and feel of a fine art gallery. 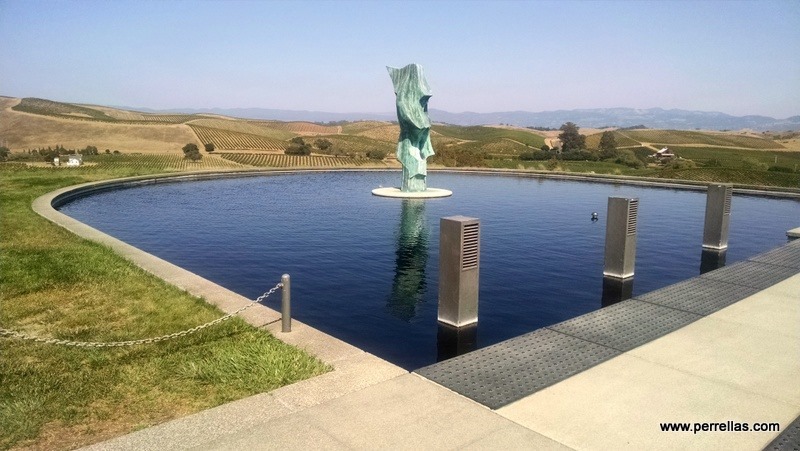 In their own words “The interplay of art and wine reaches its zenith in this setting as reflected light plays off the jewel-like tones of the elegant, hand-crafted wines…”. 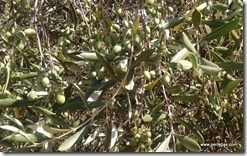 We fell into their eloquently written advertising trap and drove to the vineyard. Arriving and entering the huge expansive tasting area, the only samples available was the generic, which included whites, not a favorite of John or mine. 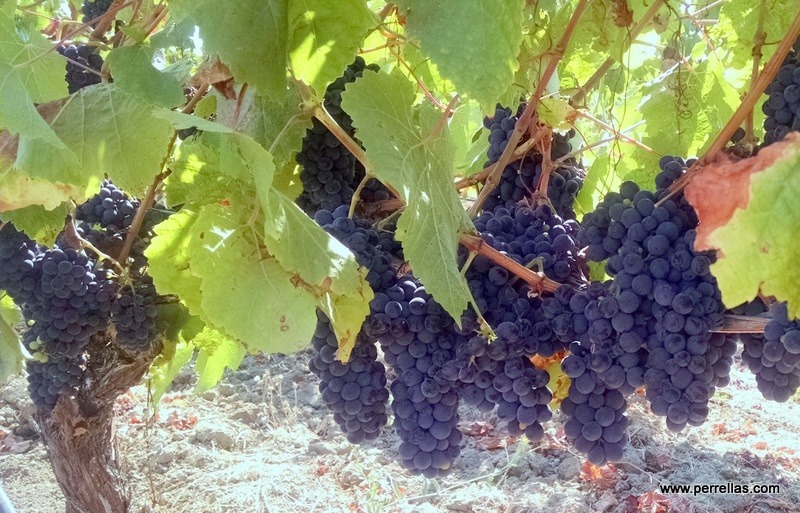 The wait, approximately an hour, left us uninterested in the high priced gamble of Artesa varietals. We walked the grounds, took a few photos and left for the next winery. 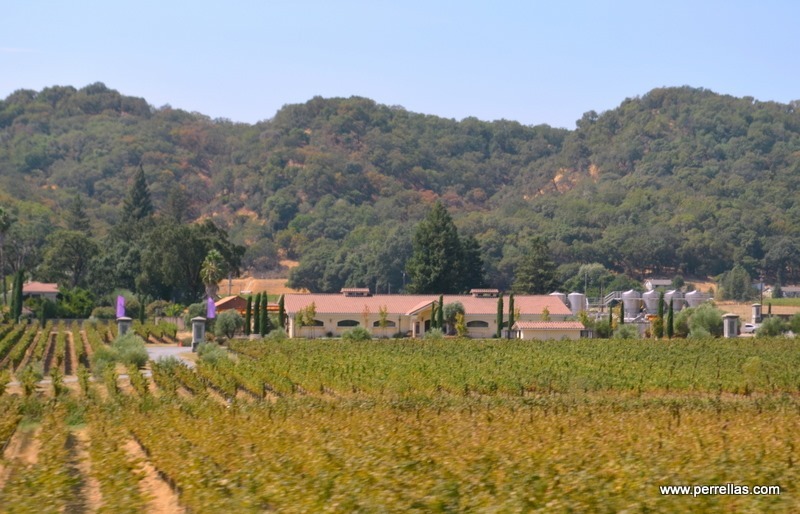 McKenzie Mueller Winery, second on our list, had claims of an exceptional Malbec. 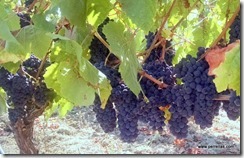 John and I are fans of the rich Malbec’s from Argentina and both curious to try Napa’s offering. Upon arrival, we were told they are appointment only. 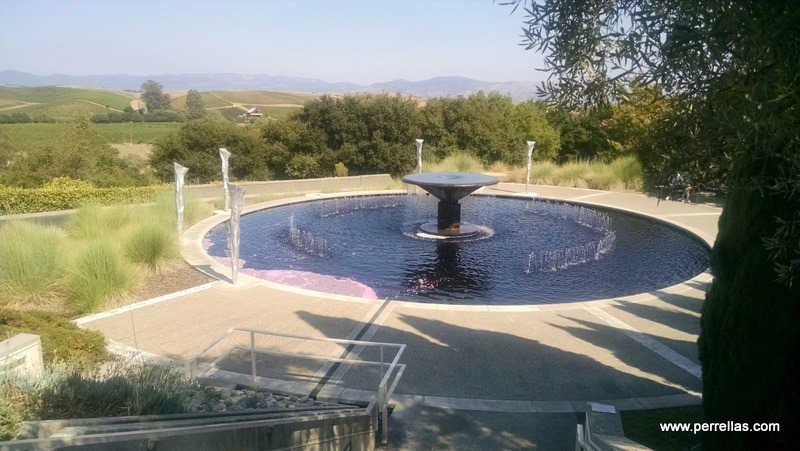 Having experienced wine pours at wineries all across the US during the past five years, neither of us realized some wineries in California are not licensed to allow walk-in’s. Useless factoid now stored for bar trivia games, we made an appointment for the following day. 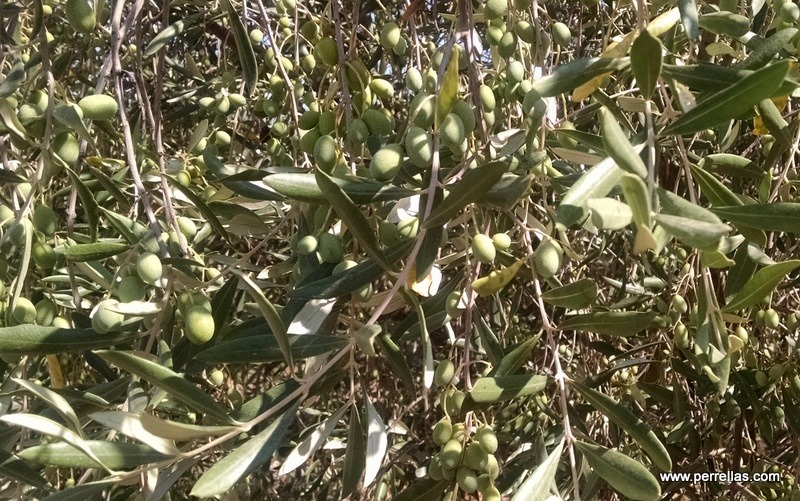 A quick Kodak Moment to photograph wine grapes and olives before our departure. Lastly, Joel Gott, one of our favorites. Upon arrival, unluckily they are closed to the public. Not the most enjoyable start to the next portion of my life as an elder but the weather was glorious, smoke was nowhere in sight, the views from the country side were breathtaking and dinner held much promise. For my birthday dinner, John make reservations at Villa Romano, a small family run Italian restaurant on the outskirts of town, charming vintage two story home turned restaurant. A glass of mellow red vino, delicious off-menu frutti di mare (fruits of the sea) tossed in a light oil with crushed garlic sauce covering al dente linguini. 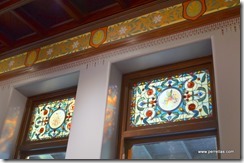 The dining room was eclectic Italian décor and nearly private, one other couple sitting near the door. We ended the night uncorking a bottle of private stock 2012 Joel Gott Estate Cabernet while watching a comedic Red Box movie. My “Life is Good” t-shirts finally are bringing the “good” back to my life and our travel adventures seem to be improving. In the morning, we will turn LilyPad in the direction of Las Vegas for John to attend our son’s bachelor party.